On my way to Savannah, Georgia, I stopped to check out a location called Jekyll Island. It's beautiful and offers great potential at sunrise and sunset. 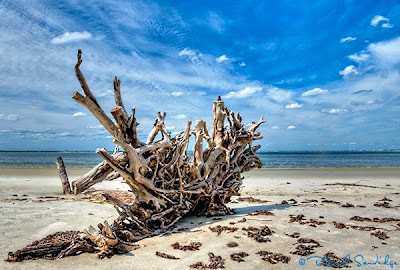 Mid afternoon, driftwood and a cloudy blue sky created an opportunity for photography in HDR. HDR, High Dynamic Range photography reveals more detail in the shadow, highlight and mid-tone areas of a scene. HDR, along with detail, color and exposure enhancing software enables you to create a more compelling image than a single photo straight from the camera. It's wonderful to have these creative options available to the digital photographer! I made three exposures two stops apart, the "correct" exposure, 2+ and 2-, and used Photomatix to generate an HDR image. The latest version Photomatix 3.2 and the Tone Mapping filter has great starting points for processing HDR images.